Like a lot of other guys, I am not a big fan of shopping. For example, there are many times in a given year I have to go to Wal-mart. Not my favorite thing to do. And one of the reasons is when you go to Wal-mart it is very common that you go there to get one thing or two things, and of course, they are never on the same side of the store, and as you push the cart along you realize, “Oh, we need this.” And “We need that, too.” What was supposed to be a short trip for a couple of things becomes much more. In the Gospel lesson, we are reminded of this sort of thing happening to us in a good/better way. Today we are reminded that when Jesus deals with us, the word “more” is a good thing. There is Always More with Jesus. Our text this morning picks up where we left off two weeks ago. After Jesus had talked about carrying His name, Jesus started on His way to Jerusalem again. Mark tells us that at that point there in Chapter 10 a man ran up to Jesus and fell on his knees before Him. Mark does not tell us much more about him, but from reading the parallel accounts in Matthew and Luke we know he was a young man, and that he was probably a member of some kind of official court or council. We also know from the Gospels that he was rich, as well. This rich and politically connected young man came to Jesus looking for answers. Interesting isn’t it? This rich, young aristocrat is seen here on his knees at the feet of a penniless prophet from Nazareth. I think that’s interesting, anyway. Another thing: Did you notice that the young man asked Jesus “What must I do?” This was a mistake. By asking what he must do, he takes God out of the picture and goes the way of false religions that say we save ourselves. This was the sort of thing the Pharisees had been teaching for years, and that was what Jesus was trying to overcome in His teachings. Going on, Jesus listed the law, to which the young man replied, “All these I have kept since I was a boy.” He wasn’t being arrogant. It sounds like it. But the Pharisees taught you broke the law only by your actions, not by your thoughts. He truly believed that he had OUTWARDLY obeyed the law. Then Mark tells us that Jesus looked at him and LOVED him. 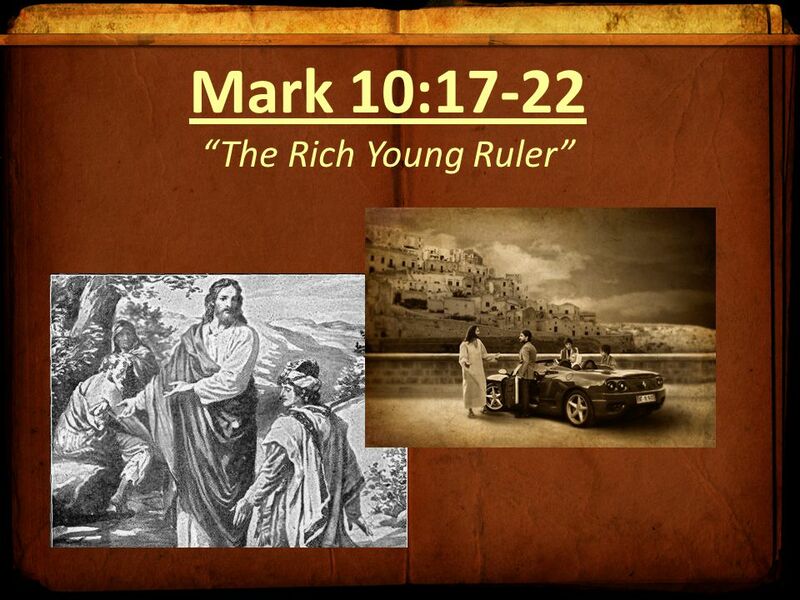 Jesus knew this was not going to work out the way the rich young ruler wanted it to. He had a flaw. Jesus told him to give all his money away and come back then and follow Him. Here Jesus does not command all Christians to sell all their possessions and give it all to the to the poor. Rather, Jesus individualizes the message of Law to this man’s need. Money was his god. And the man went away sad because he didn’t want to do that. And this, no doubt, made Jesus very sad as well, for it is His hope that all will love Him as their God, and not anything else. The Old Testament Reading (Amos 5:6–7, 10–15) reminds us how nothing escapes God’s attention. We want God, we want Jesus, to tell us we are doing a good job. But He knows our offenses in all their detail. He knows the sin that is in us. While we prefer a Jesus who tells us how wonderful we are, He confronts us with the gossip, grudges, and lack of charity toward others that actually harm people and our relationships. While we prefer a Jesus who compliments our faithfulness to home and family, He confronts us with those secret thoughts and acts that are often unfaithful. While we prefer a Jesus who blindly gives us the necessities of life, He confronts us with the fact that we typically forget to receive His good gifts with thanks (v 22). So in the text we see a guy who thought he was doing a good job, who thought that his works were saving him, and he expected a big pat on the back from Jesus. Sometimes we may get full of ourselves and think we are doing good enough by coming to church and putting an envelope in the plate. We think if we do that God will pat us on the back and say, “Well done.” But we know our works do not save us. Sin pollutes us in here. We are saved by grace. We are washed in the blood of the Lamb. Jesus’ death and resurrection save us. That is what rescues us from our sins. And the point I am trying to make to you today: God’s grace and love are even more abundant than all of our sins. As bad as our sins are, as numerous as our sins are, with God’s grace there is always more. Remember where we started today, we get More than we need. Think of it this way: Have you ever gone to Best Buy to buy a 50 inch TV, you pay for a 50 inch TV and they give you a 55 inch TV? Have you ever gone to a restaurant and ordered an 8 oz. steak, you pay for an 8 oz. steak, and they give you a 12 oz. steak? Did you ever make a reservation and pay for a trip to Cleveland for the weekend, and instead they give you two weeks in Hawaii? Well, with Jesus, there is forgiveness for all our sins and more! He gives us more grace than we need! Paul wrote, “But God, being rich in mercy….seated us with (Jesus)….so that…he might show us the immeasurable riches of His grace in kindness toward us in Christ Jesus.” It’s like David said, it isn’t that our cup of forgiveness is full, our cups runneth over. They overflow! We wrap up with this: When McDonald’s has its Monopoly game, do you play? Are you old enough to have played from 1990 to 2001? If you played during those years, you had no chance of winning. None. This summer the story was retold (The Daily Beast and Ken Klaas) about McDonald’s then head of security, a guy by the name of Jerome Jacobson, and how he stole almost all the grand prize pieces during those years. Jacobson’s thieving ways began in 1989 when he managed to get a $25,000 game piece and pass it along to his step-brother. Jacobson didn’t get caught, and he figured he was smart enough to just keep on doing this for as long as he liked. It was a plan which really worked. Jacobson collected the prize pieces, turned them over to someone he knew who would claim the prize, and got back a percentage of the winnings. Everybody in Jacobson’s circle was a winner, and nobody lost except for the McDonald’s Corporation and anyone else who played the game during those years. Remember now, this went on over a decade. Jacobson’s gang managed to collect over $24 million in cash and prizes. Eventually, they were caught, and Jacobson testified against everybody else. For a decade of stealing, he received a reduced 37-month jail sentence. * Satan tempted Judas and he was seduced into betraying Jesus and losing both hope and heaven. All these folks thought that the devil — and not the Lord — had the inside track on the truth. When the time came for them to trust God or Satan, they chose to trust the devil’s lies rather than the Gospel. We do that, too. This is why, as souls who have been rescued by Jesus, we do our best to point the skeptical and those who are lost and wandering to the blessings which come in knowing and believing in the Lamb of God who takes away the sins of the world. We want them to know that because Jesus has won, they can also be winners … every day. I want YOU to know that because Jesus has won the war against Satan, you are a winner…every day. And what do you win every day? Jesus always gives us everything we need and MORE.